Author’s note: this post is part of a longer series intended to generate discussion around the evolving demands a modern marketplace places on the tenets of “traditional” Enterprise Architecture. Parts one through two of this series can be found in my author profile. Previously, I have expounded on two critical tasks for organizations seeking to implement Enterprise Architecture: managing complexity and addressing the inevitability of technological entropy. If an organization fails to consider either of these two imperatives, they often lurch from investment to investment in a highly reactionary state. With each perturbation in market performance or every new declaration of an increased regulatory need, enterprises chase vendor offerings and software solutions in a breathless race against the onslaught of changing business needs. However, as with a ship unable to see a lighthouse in stormy seas, an enterprise without an external reference point will be captive to the confusion surrounding it. These reference points are critical anchors on the horizon that help an enterprise respond to the tumult of every day operations with the surety that, although the needs of the moment may lead to frequent small course corrections, the process is always anchored to a destination that sits outside of the froth. Without a guiding light, it is easy to become dizzy and disoriented. For large companies, a critical automation platform can be a multimillion dollar investment that may take years to implement and will operate for at least a decade. Yet companies frequently make these monumental decisions in response to a vendor solicitation or a quarter of poor sales performance. A modern Enterprise Architecture curates and formalizes a set of principle-driven guideposts that sit alongside the ongoing decision-making of the organization. These guideposts enable efforts to consistently account for the organization’s strategic needs amidst everyday operations. By providing such a navigational reference point, the modern EA can help proactively shape and manage the inevitable entropy of new technology implementation. Isolating the strategic direction and needs of the organization can empower the VMO to steer and control vendor conversations. For large companies it can even help shape the marketplace of vendor offerings. The use of principles helps bring uniform reasoning to technology investment derived not only from implementation cost, but also from a consideration of increased future costs driven by entropy. It’s all well and good to propose that strategic anchors help provide consistency and stability to technology investment considerations. IT strategies are a common discipline and are not in themselves a novel proposition. However, IT strategies vary widely in their content and structure across organizations. For some, an IT Strategy looks like the aggregated project proposals for an upcoming year. For others, an IT Strategy looks like an organizational chart and perhaps a summary of different sub-functions within IT. Many who undertake such efforts will often tether IT strategies to the broader strategy of the business, if such a strategy is articulated. The problem with many such efforts, however, is that business strategies are often loosely defined and represent some generalized performance goal such as “profitability.” Aside from being difficult to detail, there are usually numerous ways of realizing these vague goals, including pure happenstance. They also may not derive directly from the fundamental value proposition at the heart of a successful organization. Lacking a connection to principles, strategies can be a misnamed patina of fluff surrounding a reaction to immediate operational realities. If it is only this, then such a strategy cannot be reasonably expected to provide the external reference that may guide ongoing organizational management. Even if these strategies account for the overall business strategy, they may fail to draw meaningful connections between the actions or investments required of the organization and the way such investments help drive those goals. If there isn’t an explanation for how an investment serves a larger vision of the business, there’s no foundation for a genuine business case. A reliable strategic document should connect with the goals of the organization and persuasively argue for the suitability of a given effort to accomplish those goals. This anchoring strategic document helps formalize and socialize the rationale for an enterprise’s technology investments. Instead of talking primarily about actions and plans, the right strategies define the broad, strategic capabilities the organization needs, and just as importantly why they need them. A principle-driven strategy is characterized by several important features that enable it to fulfill the needs typical IT Strategies don’t meet. It must first define the scope of consideration. In a large enterprise with hundreds of millions of dollars in annual technology investment, it can be overwhelming to think of a single document encompassing and tangibly informing the thousands of technology decisions that the organization makes. Consider for a moment how a large organization might subdivide the total scope of technology investment into more manageable units. Along with the articulation of principles, this can be the most significant step in managing complexity and entropy. If the coalescing of scope elements is not properly done, then the defined scope may include and conflate considerations that are not properly connected. When this happens, the inevitable stresses of change put pressure on the connected elements differently over time. This leads to unintended fragmentation and the promotion of entropy. The scope must be drawn around technology considerations that have a high degree of mutual affinity and that are subject to shared external forces that would drive their future. This is the first act of managing enterprise complexity. Done correctly, the scope of each individual strategy will exist in a MECE (Mutually Exclusive, Collectively Exhaustive) relationship to every other such strategy. The collected corpus will sufficiently define the breadth of technology decisions and each individual element will not overlap with the others such that the forces of change will not fragment or distort their strategic value over time. Each unit of defined scope may be termed the architecture domain. Having created an appropriate means of subdividing the strategy into domains, the organization must now define the composition of a strategy’s assigned domain. I assert that the highest value a strategy can provide is the creation of a set of external future reference points, broadly communicated so that a shared future goal can inform the myriad individual decisions made daily at every level of an organization. These goals can only transcend the urgency of the moment if they are first derived by a careful consideration of principles. Principles should be used as the structure to ask questions within the scope of the domain. Each principle can be phrased as an interrogative against the concerns within the domain to elicit ideas and decisions about how that domain will evolve. A strategy’s highest function is to identify and justify what the organization is planning to do within the scope of the domain over the period of the next several years and to explain why it should do them. However, a consideration of only the principles may lead to a remote and disconnected strategy if it doesn’t include a consideration of current state realities. A SWOT (Strengths, Weaknesses, Opportunities, Threats) analysis is a popular analytical tool that helps lead an architect through an exhaustive consideration of current reality. Although the first anchoring effort of the strategy should be the application of principles, this effort must be informed by the understanding of current state to ensure that the resulting decisions and goals are well-grounded. The application of firm principles to a thorough view of the current circumstances (why) will yield an effective and actionable set of decisions that articulate future capabilities (what). A good strategy helps communicate the rationale and purpose behind technology activities and investments across the entire organization. By aligning disparate stakeholders around a shared logic, a strategy can create a powerful foundation of shared decision making that will yield significant simplification of the portfolio and an attenuation of entropy over time. With an efficient and coherent taxonomic breakdown of the business forming the structure against which strategies can be defined, the management of technological entropy has already begun. The strategies, emerging from principles, form a meta structure of reasoning that helps provide a non-volatile reference which can guide technology decisions and activities throughout the enterprise. These activities can be tested and aligned to strategic capabilities. This helps the progression of technology in the organization hew to a shared set of organizing thought that will confront the unchecked emergence of technological debt in the form of entropy over time. As in mechanical systems, entropy cannot be eliminated, only managed through the introduction of additional work to minimize effort lost due. The same is true in an EA reoriented around complexity management. The disciplined application of principle-driven strategic decision-making can help counteract unbridled complexity. 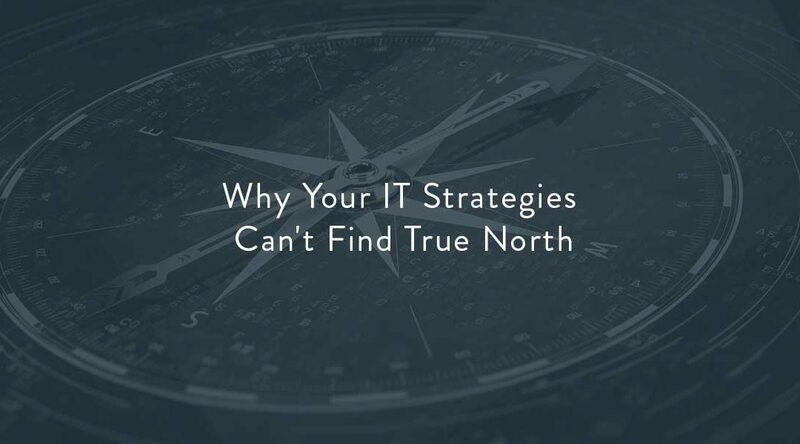 This is how strategies transcend the daily churn and begin to find their true North.